After the baby stops crying (thanks to one of the other little girls), Mrs Pocket decides to give the baby a nut-cracker to play with. Pip is worried about the baby’s safety. Jane, one of the children, tries to take the nut-cracker away before the baby puts an eye out. Mrs Pocket gets very upset with Jane for intervening. (Mrs Pocket is clue-less!) Mr Pocket, on the side of the others worried about the baby, snaps, “are infants to be nut-crackered into thir tombs, and is nobody to save them?” There is DEFINITELY some tension in this household! 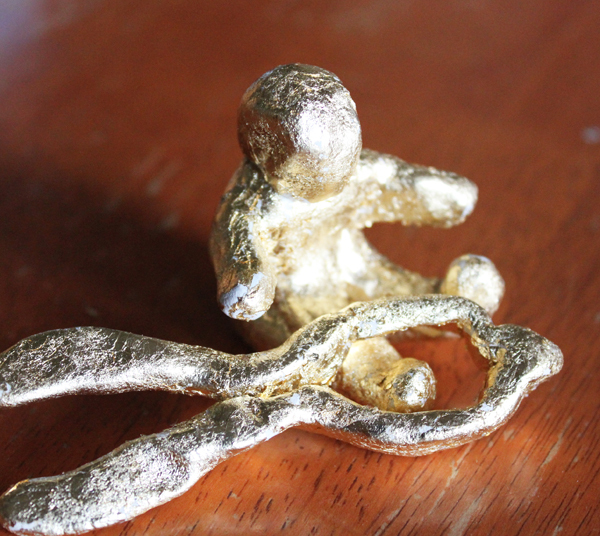 I carved this little baby and nut-cracker out of the same Crayola Air-dry clay. I decided to cover this piece in gold leaf instead of painting it. 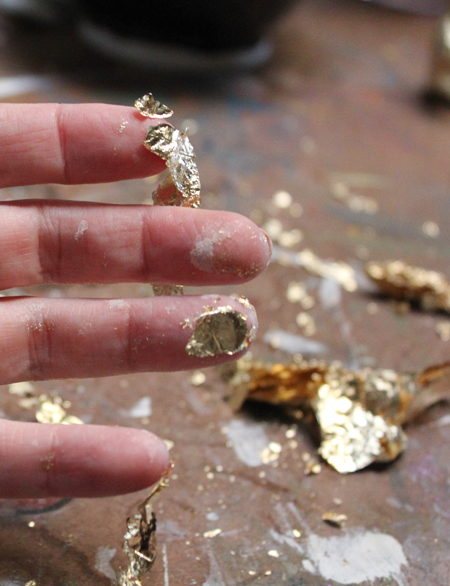 To do gold leaf, you first cover the object (or canvas) with a special glue. Let that dry for about 30 minutes and then very carefully apply the gold-leaf. The gold leaf flakes are very light and if you laugh or take a deep sign, they will be all over your house! I had little gold flakes floating everywhere! 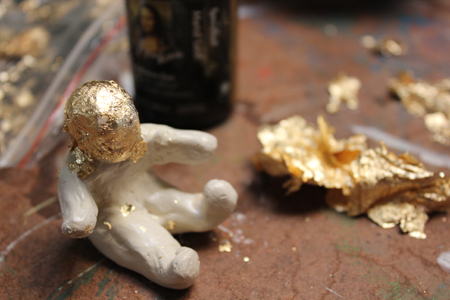 On top of that, I got a bunch of the glue on my fingers (wouldn’t wash off with hot water and soap – kind of like super glue) and therefore the gold leaf was sticking more to me than to the sculpture! I knew my husband would freak out when he got home and saw the mess I’d made, so I quickly cleaned it all up before he walked in the door!